The personal library of Mgsr. John M. Oesterreicher is just one aspect of his extensive collection available in the Archives and Special Collection Center. His personal library contained more than 5300 monographs and over 150 journal titles. As of this month all of Msgr. Oesterriecher’s books are available through the Seton Hall University library catalog and a list of journals is available through the collection’s finding aid. These materials date from the early 20th century through his death in 1993, and focus on Catholicism, Judaeo-Christian Studies and anti-Semitism. It includes works in English, German, French and Hebrew. 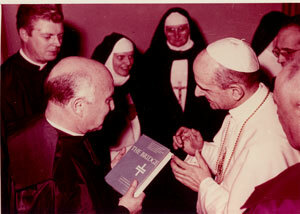 John M. Oesterreicher presents The Bridge IV to Pope Paul VI, from the John M. Oesterreicher papers, Mss 0053. See this and other images from the Oesterreicher collection at the Digital Field Archives and Special Collections Center. Mgsr. Oesterreicher was born February 2, 1904 in Stadt-Liebau, Moravia, then a part of the Austro-Hungarian Empire, into a Jewish family. He studied theology at the Universities of Graz and Vienna, was ordained to the priesthood in 1927, and in 1953 he founded the Institute for Judaeo-Christian Studies at Seton Hall University in South Orange, NJ. He served as consultor to the Secretariat for Christian Unity during several sessions of the Second Vatican Council and was named an Honorary Prelate in recognition of his work. Msgr. Oesterreicher was a prolific author, publishing several books, an underground journal in Germany in the 1930s, many pamphlets, and numerous articles. He passed away in 1993.